San Antonio is the seventh-largest city in the United States and with that comes lots of great local attractions. Check out our list of things to do and see while you're in San Antonio! 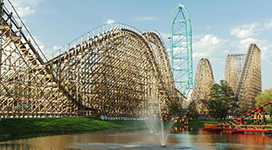 Enjoy exciting rides like the popular Superman: Krypton Coaster or family-friendly Wagon Wheel. For those looking to cool off, check out White Water Bay, full of ways to splash into summer. Check out the Tower of the Americas, a 750-foot tower giving patrons a breathtaking view of San Antonio and beyond. Enjoy a trip to the top of the tower, visit the observation deck, and make plans to enjoy lunch or dinner at Chart House Restaurant. Want to see all of Texas from overhead? Enjoy the Skies over Texas 4D Theater ride. Get the chance to see whales, dolphins, and other marine life up close. Enjoy rides like the Steel Eel or visit SeaWorld’s own Aquatica San Antonio water park. San Antonio began as a community of five Spanish colonial missions built along the spring-fed San Antonio River. Today, all five missions are open to the public, including the Alamo. Also stop by the Espada Acequia at Mission Espada—this irrigation system is one of the oldest of its kind and was originally constructed to irrigate the mission’s surrounding farmlands. For easy access from mission to mission, San Antonio’s 12-mile Mission Trail is perfect and welcomes hiking and biking. Looking for a riverside oasis to indulge in cultural beauty, shaded parks, and the sounds of lapping waves? Escape to San Antonio’s famed River Walk. This crossroads of culture and commerce offers meandering pathways along the banks of the San Antonio River, one story beneath the city proper. 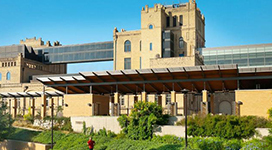 Along the River Walk, be sure to check out the shops and restaurants of Museum Reach, which stretches north from downtown and connects the existing River Walk to the San Antonio Museum of Art and the Pearl Brewery complex. Public art lines the banks. And don’t miss the lock and dam system, the only one in Texas. Along the banks of the River Walk, you’ll find La Villita, “the little village.” Originally established by Spanish soldiers stationed at the Alamo, La Villita has been reincarnated as a historic arts village with beautifully restored residences, galleries, and shops full of interesting sights. You might even catch a performance at La Villita’s outdoor Arneson River Theatre. Located adjacent to the River Walk and San Fernando Cathedral, the nation’s largest cathedral sanctuary, Main Plaza, is ready to welcome you with a medley of free weekend concerts—from legendary conjunto performers and troubadours to blues and country musicians. Sit back under the centuries-old live oaks, listen to the many fountains, and discover what a weekend in San Antonio is really like. The San Antonio Summer Art and Jazz Festival, an annual free three-day event held on the first full weekend of June, features jazz concerts, an arts and crafts fair, and delicious Texas cuisine. It's great fun and entertainment for the whole family. San Antonio’s culture thrives in a variety of arts districts. One burgeoning art scene is Southtown. Here you can stop into Garcia Art Glass and watch celebrated glass blower Gini Garcia and her talented staff create one-of-a-kind keepsakes. Not far away, Market Square (the largest Mexican market in the nation) is a haven for working artists. From painters and musicians to woodworkers and a blacksmith, this sanctuary of culture is a San Antonio must-see. Just south of downtown, the King William Historic District—the first historic district in Texas—reflects San Antonio’s European heritage in a gracious residential area settled in the late 1800s by German immigrants. These beautiful Greek revival, Victorian, and Italianate-style mansions have been well maintained and are considered to comprise one of San Antonio’s most elite neighborhoods. Take a self-guided walking tour. Free brochure guides and maps are provided at saconservation.org. The San Antonio Zoo is the third-largest zoo in the country with winding paths, limestone cliffs, and large shady trees. While visiting the zoo, hop aboard the zoo’s miniature Eagle Train and take a journey through the park's shaded landscapes and attractions. Free Thursday nights and the first Sunday of the month. The McNay Art Museum is set in a 1920s mansion and has wide-ranging collections, including post-impressionist and modern pieces, theater-centered works, medieval offerings, Native American art, and more. Free first and Third Tuesdays from 6:30-8:30 PM. San Antonio’s new museum for kids, The DoSeum, opened on June 6, 2015. The three-story facility promotes learning and discovery through interactive exhibits and creative programs. Free Tuesdays from 4:00-9:00 PM and Sundays from 10:00 AM-12:00 PM. The San Antonio Museum of Art is housed in a castle-like building that was formerly the Lone Star Brewery. This museum is noted for its antiquities collections and the 30,000-square-foot Nelson A. Rockefeller Center for Latin American Art—the largest repository of its kind. Free Tuesdays from 3:00-8:00 PM. The Witte Museum is San Antonio's premier museum of South Texas history, culture, and natural science. Located on the banks of the San Antonio River, the Witte offers permanent exhibits that include dinosaur skeletons, cave drawings, wildlife dioramas, and even several historic homes. The Phil Hardberger Park features 1.5 miles of multi-use trails, a 1.8-acre dog park, picnic facilities, and a large playground. 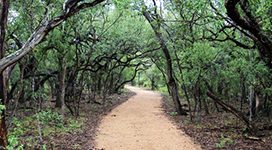 For even more outdoor action, park-goers can access the Salado Creek Greenway Blanco to Huebner segment near the Voelcker homestead and enjoy an additional 1.7 miles of trail. One of the city’s most beloved parks, Brackenridge Park, is a 343-acre refuge in the heart of the city, adjacent to the San Antonio Zoo, that offers a full day of family fun. This oak-studded oasis follows the northern bends of the San Antonio River, creating many alcoves perfect for picnics. There is also a stunning playground, trails for quiet walks, and a dog park for four-legged entertainment. Sidled up next to Brackenridge Park is the Japanese Tea Garden, a botanical retreat that offers stone walking paths woven through ambient gardens and ponds brimming with koi. Originally the site of San Antonio’s 1968 World’s Fair, Hemisfair Park is a lush greenscape in the middle of bustling downtown San Antonio. Enjoy water gardens, public art, and historic homes as well as an imaginative 15-acre playground for kids. Splurge on the modest entrance fees to The Magik Theater for children, the Institute of Texan Cultures, and the 750-foot-tall Tower of the Americas. San Antonio's oldest park and the second-oldest park in the US behind Boston Common, San Pedro Springs Park provides a beautiful and historic setting where you can take a swim in a lake shaded by cypress trees. The park is also home to The Playhouse, the San Pedro Library, McFarlin Tennis Center, and the Koger Stokes Softball Complex.